This is the second in a series chronicling my memories of 1940s Wheatland, Pennsylvania, a tiny village in the Shenango River flatlands of western Pennsylvania, that was totally destroyed by a tornado in 1985. In this installment you can read about my family’s move to a barn, our neighbors and playmates, grocery stores big and small and one on wheels, the first television I ever saw, my dad’s cow and sheep, and the dumping of the slag. Thinking about our family’s 1945 move from 199 Third Street to 32 Second Street in Wheatland, PA, reminds me of The Jeffersons’ theme song, “Movin’ On Up.” We had not only moved to higher land to avoid the periodic flooding from the nearby Shenango River. We were moving upward financially as well, just as many families were able to do following World War II. A year after my dad returned from the war, he decided he didn’t have much of a future in subsistence farming and accepted a position with Sharon Steel Company as a draftsman. Later, with the printing training and experience he had gained before the war, he secured a position in the composing room for the local newspaper, The Sharon Herald. Having sold the Third Street house and now earning a regular income, Dad was able to remodel my grandfather’s barn into a home for our family. During the year this went on, our family stayed in a small three-room house adjacent to the barn. It had been my grandfather’s home since the 1930s. By 1946, Grandpa was tired of Pennsylvania’s cold winters which he felt contributed to his arthritic aches and pains. So, at the age of 62, he rode the Greyhound bus from Sharon across the United States to a small town in California where he contentedly lived out the rest of his life. We called Grandpa Angel’s house “the shack” since it was roughly built with board-and-batten and tarpaper and didn’t have much in the way of modern conveniences. I remember bathing in a galvanized tub on the table in a very chilly kitchen. In place of an electric refrigerator, my mother would store food on a shelf outside the kitchen window in the winter and used an icebox that contained a huge block of ice in the summer. I don’t recall the actual move to the remodeled barn, but it must have been a big occasion for my parents. We could now enjoy the marvels of a telephone, a modern refrigerator, a hot water tank, an indoor bathroom and lots of space! The only reminder that it was once a barn was the sliding barn door on one end of the building. It led into a hayloft, still full of sweet-smelling hay. I visited Wheatland several years after the devastating tornado of 1985, only to find fields of weeds scattered with debris. No landmarks were left to help with orientation, except the street signs. All I could find of my childhood home was its stone foundation. Ann Angel and her mother, Susie, in front of barn being remodeled into a house. September 1947, Wheatland, PA..
Left to rt: Simone, Ann & Mike Angel, Beverly. May 1947, Wheatland, PA.
Ann and Mike Angel with playmate, July 1945, Wheatland, PA.
Playmate, “Kitsy.” May 1947, Wheatland, PA.
After the move to the remodeled barn, which involved using a horse and wagon to haul our household belongings, my memories begin in earnest. After almost 70 years, I can still name some of the families in the area of this short section of the unpaved cinder-covered Second Street, most of whom provided one or two playmates for my brother and me. Mr. Dobbs was an herbalist who had a big following of “patients”…. He was well-liked and held in high esteem as a professional throughout the immediate area. Mr. Dobbs was not hesitant to show his knowledge of which greens to pick and prepare for medicinal purposes. Mr. Dobbs was literate, a good conversationalist, and a non-active member of the Masonic Order. …Mrs. Dobbs, a slender, small person, was also liked by all the neighbors. She doted on our children as if a grandmother. …We were welcomed in her home, as she was in ours. The Billobocky (Bielobockie?) family lived next to the Dobbs and included a little curly-haired girl named Simone. Farther down Second Street, on the corner of Second and Church streets, was the Behr (Bayer?) family. Kathleen Behr, who introduced herself as “Kitsy,” was my very first friend, whom I met when we first arrived in Wheatland. Her house was a mansion in my mind. It was a tall two-story wood frame structure and had not one, but two bathrooms upstairs. At the edge of the road in front of the house was a once-ornate but now weathered stone step. I was told this step was used to step down from horse-drawn carriages in the days before autos. Other names are a bit fuzzy now, but studying the U.S. Census of 1940, I’m reminded of the Ludu’s and the Radu’s, who were among our Romanian friends. And I recall the Roach family, whose little girl Judy was another buddy of mine. They lived a block away on First Street, next to a little mom-and-pop grocery store. The little corner store in Wheatland Flats must have had a name but I don’t recall it. The steps up to the store’s front door seemed high and steep to a little girl, but the climb was worth it when I had a penny for a piece of candy. In case one’s preference was on the sour side, the store had a barrel of pickles in front of the candy counter. For most of the items you wished to purchase, you told the grocer what you wanted and he retrieved it from the shelves behind the counter. On the left was a meat counter and behind it was the butcher working at a thick wooden table set on a sawdust-covered floor. The store served as our “mini-mart” between the family’s weekly visits to Wheatland’s Golden Dawn Supermarket on Broadway or the A&P in Farrell. Occasionally, our house was visited by the driver of a brown and yellow Jewel Tea Company truck. This little door-to-door “Home Shopping Service” on wheels sold pots and pans, dishes, cleaning supplies, groceries, and dry goods. And a Hopalong Cassidy coloring book that my mother purchased for me and which I treasured for years. Indian Head Television Test Pattern by RCA [Public domain], via Wikimedia Commons. I watched my very first television at the home of another playmate, Emile, who lived on what was probably West First Street. 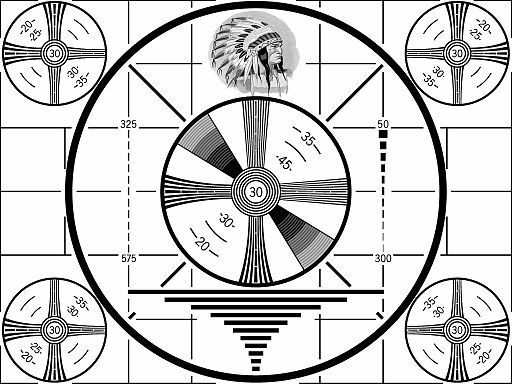 TV programs would only air in the evening and while we anxiously waited for them to begin we would stare at a test pattern featuring an American Indian. I’m not sure what we watched in those early days, but I do know the pictures were black and white and rather snowy. Sometimes the picture would start moving up or down as if a film projector malfunctioned, but there was a “horizontal” button on the TV set to fix that. There was also a “vertical” button and a dial to lighten or darken the screen. To change a channel, the father in the family would pull on cables that ran from the TV through the floor and to the antenna on the roof. I remember the ghostly figures of nearby residents politely standing outside of the living room windows also watching this amazing combination of radio and a moving picture. Even after Dad left farming to become a wage-earner, he kept one of his cows. She was a docile orange/red and white spotted cow, whom we simply called “the Guernsey.” Every morning and evening, before and after work, Dad would walk to the end of Second Street and down into the pasture with a milk bucket and stool, followed by several of us kids after school, and a cat or two. Our job was to use small thin tree limbs to switch at any flies pestering the cow. The cow produced enough milk to share not only with the cats but with neighbors. Mom turned the cream into butter, using a wooden paddle churn that was operated by turning a handle. Although we children enjoyed these gifts from our cow, the best part of all was the pastureland itself, an acreage of thick green grass which we could romp in and explore as we pleased. Ann Angel and the sheep. Second Street, Wheatland, PA, 1947. Dad and Mike Angel with our cows. Second Street, Wheatland, PA, 1947. For awhile, Dad also pastured a couple of sheep in our large expansive front yard. I’m not sure what he intended to do with the sheep. Maybe he was channeling his Romanian father’s occupation as a sheep farmer before coming to America. In any case, the sheep were useful in keeping the grass and weeds trimmed. 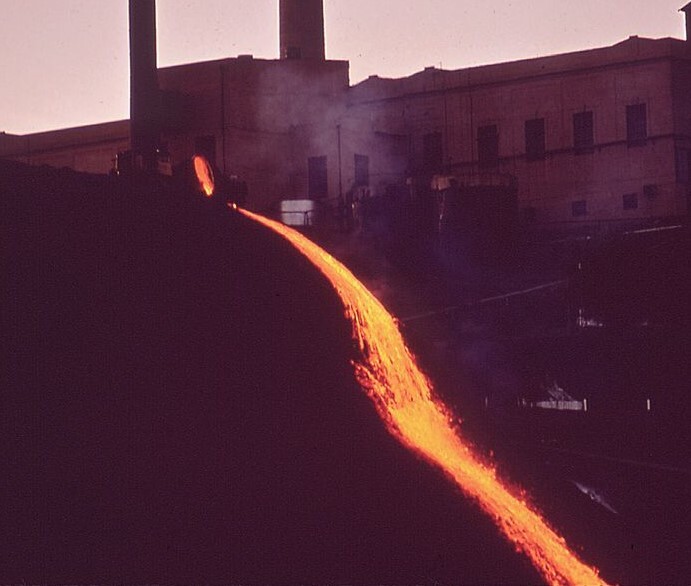 “They’re pouring the slag!” was the call to run outside and watch one of the most spectacular night-time sights of our childhood. Along the top ridge of a hill about a half-mile from our house, a switcher engine pulled a string of huge pots into place. Then each pot would tilt two by two, pouring parallel rivers of hot molten slag down the slope. The slag was the byproduct of steelmaking by the local steel mill and in those days was discarded as waste. We marveled at the brilliant orange-yellow-red colors of the slag lighting up the sky, as thousands of sparks and huge plumes of smoke rose upward, accompanied by the odor of burning metal. It was as thrilling an event as any fireworks display and it occurred for our viewing pleasure several times a month. — Ann Angel Eberhardt, SHS 1958, Goodyear, AZ. October 2016. “That stone step you referred to in front of Kitsy’s house was still there throughout the 60s and into the 70s. Interestingly enough, I think it was still there in 1985 when we were checking out the tornado damage shortly after it struck….